Billy Goat Model HW651HSP is usefull to mow knee high grass and overgrown vegatation that standard walkbehind mowers can't handle. It has a 24" cut and is adjustable in height from 2" to 4" in 1/2" increments. 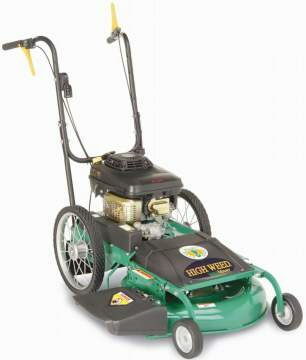 This mower is not self propelled but has large rear wheels for ease of use in tall grass or uneven terrain. Weight 154lbs width 32" including deflector Height 43" Length 62"
* Please call us for any questions on our mower weedcutter 6.5hp billy goat rentals in Portland OR, Gresham OR, Milwaukee OR, and surrounding metro area.